The change in greenhouse operation and technology in the last 20 years has been unprecedented. Photoperiodic control, mist propagation, green- house cooling, clean stock programs, CO injection, to name a few, have 2 all been inaugurated as regular greenhouse practices in this time. The introduction of new markets, new production centers, shifts in public attitudes, and the realization that greenhouse production is not simply growing crops, but the management of an enterprise in which people work, h~ve combined to make this agricultural practice a challenging and rewarding vocation. 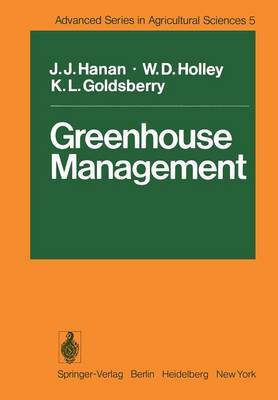 The greenhouse grower, manager, and student who are training for this vocation have not had an up-to-date text book for many years. It has been our goal to bring both published and unpublished work together in this book, and to provide a bench mark from which we can continue to move forward. It is not until a process of writing a text begins that one fully realizes how far we have come-and where we need to go. It is with some sadness that we realize that this book is not likely to remain long as an expression of the state-of-the-art. We do not expect it to be easy reading; for new terms, new technology, and new ways of doing things are not always easy.